The ‘bushies’ as they have become affectionately known as started life in the winter of 1998. The then 15 strong crew were approached by a Parks and Conservation ranger (namely our own Steve Welch) to assist in revegetation after the removal of the last stands of commercially grown pine plantations (known as the Boboyan Pine Plantations) in the Namadgi National Park. Water testing in the area began with ACT Parks rangers assessing the effects on water quality by the removal of the pine trees. No change was noticed and after a year to 18 months the monitoring was ceased. At the time Waterwatch did not feature much on the ‘bushies’ radar. This changed after the 2003 bushfires left large areas of the ACT devastated. The President signed the group up to become part of the massive ‘C.A.M.P.F.I.R.E.’ (Community Assessment Monitoring Program for Fire Impacted River Ecology.) shortly after the fires. Most of the park was affected by ‘crown fires’ and sporadic grass fires. Damage was compounded in a region already struggling with the effects of prolonged drought. The most dramatic change was to a wetland region located along Hospital Creek, so name as it was an area used by the settlers to graze stock recovering from illnesses as it is relatively sheltered with a good feed and water supply. After 2003, fast moving water flowing from the surrounding denuded hills caved a channel in the wetlands essentially draining and drying the surrounding area. 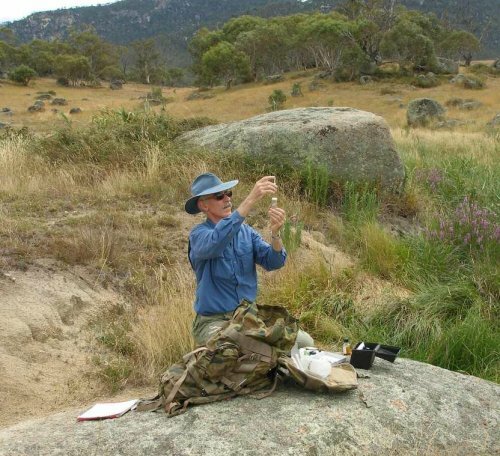 Martin Chalk was/is arguably one of the most prolific Waterwatchers in Canberra. 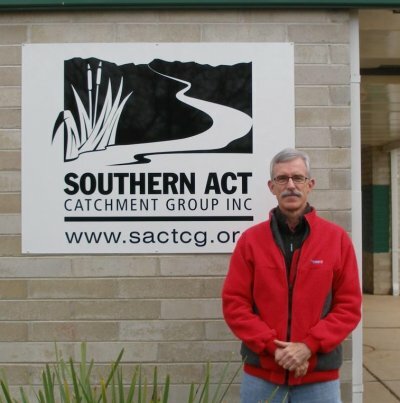 He, along with Joan Goodrum and Cathy Horan monitored the southern-most sites in the ACT to provide data for an entire sub-catchment, namely the Gudgenby River. They monitored 10 sites in total, every month, for 5 years for the CAMPFIRE program. Martin has slowed a little these days, but still monitors the greatest number of sites, 7 in total, for our catchment group. He heads south every two months to check on Bogong Creek, Hospital Creek and Little Dry Creek, which flows from Mura swamp. These are literally within waking distance of the southern ACT border. Martin carried the Waterwatch torch for the ‘Bushies’ on his own for 4-5 years. His memories of the region prior to 1998 stem from his passion for bushwalking, as is often the case with many of our members. He recounts how prior to 1995 finding fresh drinking water was never an issue for walkers in this region but these days it’s getting harder. The location of many of the old huts adds fuel to Martin’s observations that water levels in these valuable high country creeks is running significantly lower than they did historically. When the huts were built, Martin argues, they would have been positioned within easy reach of a good water source. This would have been the first logical solution to providing a regular water supply, with rain tanks, where present, most probably being a later inclusion. Anyone who visits the huts these days will know that the story is very different now. Martin says that Waterwatch in this region has really changed focus from monitoring the effects of fire damage to monitoring the (more sinister?) effects of long term drought. He has been joined recently by Michael and Christine Goonrey and Les Dickson. Les has been with the ‘Bushies’ for a couple of years. Michael and Christine joined just after the 2003 fires. Michael is now the president of the Gudgenby Bush Regenerators and had been helping Martin with his Waterwatching on and off for about 12 months. The data from the ‘Bushies’group provides a valuable ‘background’ to assess the overall quality of water flowing through the ACT as it is arguably our region’s purest water source. If you are interested in finding out more about the ‘Gudgenby Bush Regeneration Group’ or indeed any of our Waterwatch activities please contact Martin Lind on 6296 6400 (Mon-Wed), or email Waterwatch@sactcg.org.au .